Some of our regular visitors might be aware that last December (before her 3rd birthday) our puppy Cassie was run over and sadly died. She was a precious little dog, well loved of our visitors children and a very happy little soul. Andrew and I were lost without her. Eventually we realised that we actually NEEDED another dog not only to fill the void left by Cassie, but because essentially we are dog lovers, and felt quite lost without one. So welcome PIGLET! She came to us in May and in just two short months has made herself very much at home! Our visitors and their children love her already - even though she has very puppyish ways (including sharpish claws and a love of biting still). She is very sociable and loves other dogs. We are awaiting a new device to fit on her collar so that we can monitor her whereabouts at all times, since she has the 'wonderlust' that all our Jack Russell dogs have had. The season is well underway and already we have met many guests with whom we have made friends, together with seeing many old friends also. All of the cottages were painted throughout over the winter and Andrew continues to tend the individual cottage gardens despite the problem with water this early summer. (He walks miles with a watering can)! Luckily we have a full-house for August and quite a bit of September, but if you fancy an autumn break there are still plenty of cottage slots available. Dorset is wonderful in the autumn, less crowded and the pace of life slows a bit, perfect antidote for the stress of modern life. Here you can relax, unwind and explore the beautiful coast and countryside. It was a busy Christmas and New-Year and as usual we decorated inside and outside of the cottages for our guests. Each one had its own Christmas Tree and chocolate treats for the children. We were full for both Christmas and New-Year, then had a short breather and guests again in early January. We went of to S'Agaro for much of January, (see the page on our website, wonderful Costa Brava location). And came back to Graston Farm refreshed and ready for half-term and an early Easter. Bookings for our cottages are going well, and we have some lovely friends returning once again. In a month we will be feeding lambs again and our calves are coming on nicely too. Andrew gets a regular audience for feeding times! And the 'Mabels" continue to lay despite the short days. We have one sadness to share with our regular visitors, tragically Cassie was run over and killed just before Christmas and just short of her 3rd birthday. She was walking with a neighbour and a 4x4 - the driver of which thought she was out of the way - ran back over her. She didn't suffer and died instantly - but we miss her so much!!! God bless Cassie - we miss you! Dippy the dinosaur is visiting Dorset and can be found at Dorchester museum. We also have a replica 'skull' in Bridport Museum. Come and see the sort of beasts that lived here on Dorset's Jurassic before the Baileys came along! So don't miss a minute of Graston Farm this year!!
' Well we have loads of visitors at Graston Farm at present, with cottages, caravans and the B&B busy this week. We have had some smashing guests, particularly those with doggies - or who take a special shine to me!!! Last week it was the Norris's whose big dog Jed became a special friend. Here we are playing in the caravan paddock! Sally Ann and Stuart, Jed's parents also brought me TREATS! Woof Woof! Then this week Martha brought her family to visit me too. She was great and took me for walks. She had two brothers Toby and Richard and they spoilt me rotten! Now a whole new lot of guests have arrived and they are slowly getting used to the fact that I sometimes tag along on walks and pop-into their caravans and gardens. For some reason I had to be brought home this morning in a very smart van from the leisure park next door,I have no idea why - I know my way home perfectly! Hey Ho! I never get tired of meeting new people! Following a full refurbishment Barn Cottage is now taking guests again. We have refitted the kitchen and bathroom, added a shower room downstairs and fitted new carpets and flooring. There is a new wood burning stove in the cosy sitting room, and new new door out to the beautiful garden - where we discovered a well during our works! Barn Cottage has a gorgeous and very private garden and at this time of your it is a tranquil place to rest, read and relax. You will have your own parking place and plenty of room if you have more than one car in your party. Barn cottage is undergoing a major make-over and progress is being made with a new bathroom, kitchen and downstairs shower room. Everywhere has been painted and we have new carpets and wooden floors throughout. The new wood burning stove is installed and we provide a complimentary basket of logs - hopefully the weather will mean you don't need them! We discovered an old well underneath the foundations in the front garden, which we have tidied up and which provides a point of interest in front of the new sitting room door. But best of all - the garden is looking so beautiful at present. The lilac bush is in full flower and many of the mature shrubs are starting to look ready to bloom. The garden in Barn cottage is at the front of the plot, however, it is beautifully secluded and private. We also have some new little lambs - just arrived and pictured here with the bit of the farmer's thumb. They are smashing little chaps, and are taking their milk more easily every day. Together with their 4 big sisters and the four calves there is plenty of feeding to be done - which guests can watch at least twice a day. So all in all plenty to do at Graston Farm, and Barn Cottage is rapidly getting ready for guests soon! We were very pleased to accommodate the Nene Trekkers for a long weekend recently. These guys really put in some serious miles whilst they were with us, and were great company and good to have around. They took Courtyard and Cobbles cottages, meaning that through the interconnecting door they could use the two properties as one. The group really enjoyed local walks and most said they'd like to return to Graston Farm Cottages. Where fewer people stay and don't use all of the rooms/linen etc., we can offer a discount, making it economically possible for couples to holiday at reasonable cost. The Nene Trekkers have been together since 1979! We have also got some new friends on the farm, four lovely calves, which the children this week, have really enjoyed watching being fed. I introduced the Nene Trekkers to the new calves and all were entranced at how beautiful they are. The calves have adjusted to life at Graston Farm very quickly - settling in and feeding well. They are very sociable too! With Easter approaching we are planning our Easter egg hunt. We have three cottages full for Easter and so there will be plenty of opportunities to hide and seek the eggs. Here at Graston Farm Cottages we have had some lovely families to stay during the period after Christmas, and last week for half-term we were full to the gunnels! All of the families we have had staying have found loads to do in West Dorset, and most have been sad to leave after their break with us. Cassie remains a real favourite with the children - and a good many adults too. Last week we looked everywhere for her, she does like to join people for a walk - even people just walking on the farm tracks - so we thought she had gone for a stroll. However, on further investigation, she was curled up in Cobbles Cottage with the little family staying there!! We have early signs of Spring showing here on the Farm, with Daffodils and Snowdrops all over the place. We have had very little real winter weather - we often come of lightly here on the coast - however we feel a little nervous that we might get a late 'snap'. Never mind all of the cottages have cosy wood burning stoves and are fully heated by our Biomas boiler, so always cosy inside. We have been doing some work on Barn Cottage, new bathroom, kitchen and carpets etc. To our surprise and delight our builders discovered a WELL in the front garden, in front of the cottage. It seems to be very deep, so we have been building up the sides and will install a safety grid on the top. But now it is found its definitely staying! So! we are looking forward to our spring and summer guests, to welcoming some new spring lambs into the paddock and generally having a fun time! At New-Year we had our usual Firework display (Andrew a great firework technician)! and some of our guests also let of some amazing rockets to herald 2017. Stile Cottage (plus the other three) for Christmas Day lunch! A squash but they made it! Here at Graston Farm were all ready for Christmas and one family has taken all four of our cottages for the festive season. They have all arrived, settled in and enjoying their time by our lovely wood burning fires. Cassie is very curious about the Christmas tree in the farmhouse, and is generally energised by the fact that there is clearly something on the horizon - probably because there is so much baking going on, and so many cake bowls to lick - lucky girl. Tomorrow our family arrives and we shall be going to the annual Crib Service at St. Mary the Virgin in Burton Bradstock. This will be followed by 11am service on Christmas morning, and then drinks for the neighbours chez nous! Shame about the weather - but lovely and cosy here at Graston Farm! Merry Christmas! Cassie is spotted discussing important matters with our smallest lamb Minnie! Minnie was tiny when she came to Graston Farm, but soon overtook her play mates and was almost the largest when they came to be moved on earlier this month. It looks like Cassie is giving her the tip-off that they might be on the move! '..........Hear this Minnie - I've got a secret to tell you! 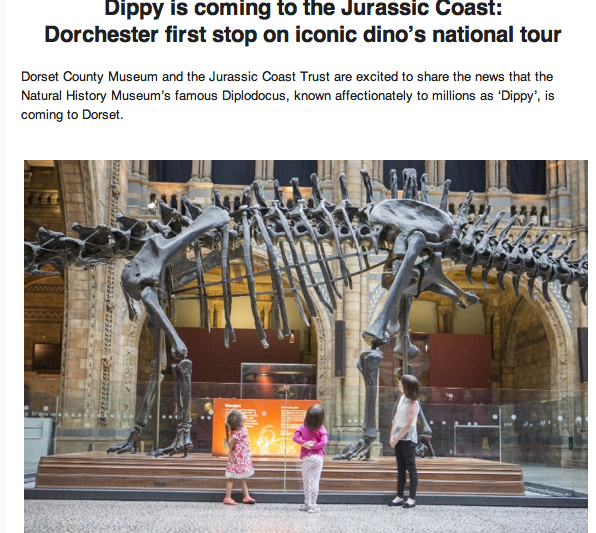 Dippy is coming to the Jurassic Coast: Dorchester first stop! Director of Dorset County Museum, Dr Jon Murden and Dr Sam Rose, Jurassic Coast are excited to be welcoming Dippy to the heart of the Jurassic Coast World Heritage Site, and agree that “as the birthplace of palaeontology, there is nowhere in the UK more appropriate for Dippy to start his national tour than Dorset and we’re thrilled to have been chosen as the first host venue." The Jurassic Coast Trust is delighted to be partnering with Dorset County Museum to bring Dippy to Dorset. We will be working with schools, community groups, local charities, children’s centres, and other museums and visitor centres along the length of the World Heritage Site to help people across the region take full advantage of this once-in-a-lifetime opportunity. Every day at Graston Farm we feed the fish in our garden fish pond. Yesterday whilst my back was turned Cassie decided she rather liked the fishes' food! She often gets perilously close to the edge and one day I'm sure she will loose her footing (or pawing) and fall in. It was a beautiful day and one for spending time in the garden. We do have some little children in the cottages this week, who are a bit intrigued by Cassie, but they are too young yet, to get down and really enjoy playing with her. Over the summer several items have been left in the cottages, and not always discovered straight away! (Note to the cleaners - please check every drawer, every week!) Displayed below are some of the precious things left by visitors - if you recognise them, let me know and I'll post them on to you. We've loved having all of our guests this year, and hope that that they recognise these items and claim them soon. With the 'season' (thats what Andrew and Chrissie call it) drawing to a close, I'm afraid life has got a little bit boring. All of the great children who visited over the last month have gone home (some to places like Australia, New Zealand and Canada) and I only have Chrissie and Andrew to play with now. There are visitors still in our cottages, and they seem really happy, but they don't have children. Still a few have nice little doggies - so not all bad! Chrissie says that you should check out the Literary Festival coming up in Bridport (www.bridlit.com) in November - some really great authors and celebs are coming to talk about their books? (I personally find books very tasty!) We apparently have room for extra guests that week if you are tempted. With it being autumn the days don't seem to last so long, and everything feels a bit busy, the farmer is working a lot with harvest and moving animals around the place. We are still looking after calves, hens and lambs and a good supply of eggs is still forthcoming from 'The Mables'. I guess I'd better get used to a quieter life for a while, however, A&C keep mentioning something called half-term, sounds hopeful to me! Happy days - must roll over now! Quite frequently when we have a big changeover day, the skies are grey and wet stuff falls from the clouds above. Not today! Clear blue skies and lovely warm sunshine, which together with a beautiful breeze means perfect drying weather. Cassie has had such fun over the last three weeks, with a visit from James and Rebecca followed by children in most of the cottages, she has been in seventh heaven. But yesterday during the changeover she was completely stumped as to where all her new friends had gone. However by this morning normal service was resumed, with loads of new children in the cottages and many coming to collect eggs from the chickens, offer to take her for a walk and making a general fuss of her. We also had Kiya to stay in the house last night - with her Mum and Grandparents, and that meant lots of fun after they had eaten their breakfast. Not such a bad life! "Well! I don't know what all of the fuss is about. I expect it is because it is something they call 'changeover day', but my humans are real mad with me! Nearby we have a building site, where the some other humans are working on a house and garden. There the humans are always pleased to see me, and make quite a fuss of me - including letting me sit in their vans sometimes. Well I was feeling a bit left out this morning since my little friend in Hopscotch cottage was having a 'lie-in' and because of the 'changeover day' thing all my humans were busy. So thought I'd pay my chums at the building site a little visit. One of the humans had left the door of his van open so I snuggled down for a while in the warm sunshine. Whereupon I discovered a little package of food, which he must have left for me - all nicely wrapped with cling film - Great! I rushed home - very proud - to show Chrissie what I'd got - and she was most iffy, she was really worried that the food was intended for someone else, and kept saying she'd have to make more sandwiches to replace those I'd stolen! Stolen! Anyway - I'm keeping a low profile this afternoon, in my favourite place in the garden room. I don't think Chrissie knows I'm here since she normally gets iffy with me when B&B guests are coming, she doesn't agree that a nice light dusting of white hairs enhances the furniture! Hey Ho! nearly supper time! Just lately we have had a real influx of lovely pictures drawn for us by our guests' children. The latest family, who were visiting from Sweden drew these lovely pictures after helping Andrew feed the lambs and calves every day of their stay. 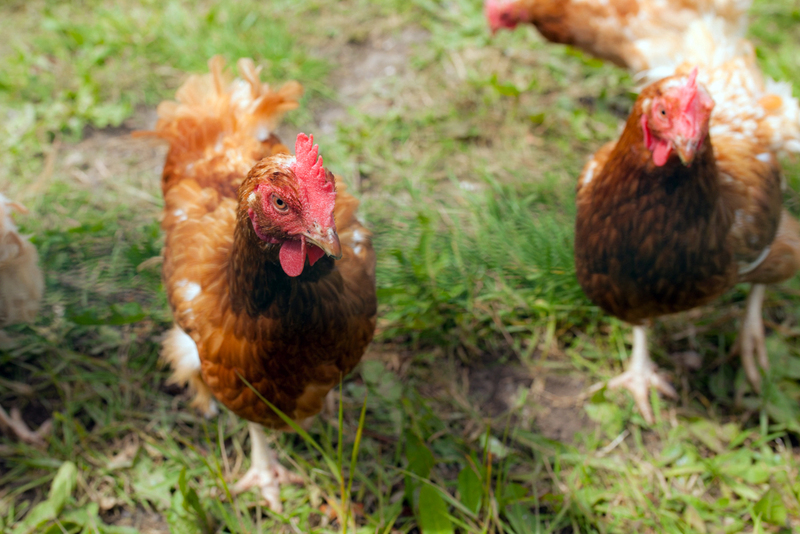 They also collected eggs every morning from the hens and were just great to have around. When I'm laying the table for my breakfast guests I love to wander out into the lanes on the farm and pick fresh country flowers for the table. This morning my guests came down to red campion, oxeye daisies, and buttercups. This weekend at Graston Farm we have welcomed thee families into the cottages, three caravan/campers into the paddock and three guests are staying with us in the farmhouse. This morning James and Isla - two of our cottage guests who are both in the region of four years of old, came to collect eggs from the 'Mabels'. They (the Mabels) gave us four lovely eggs on that visit to the coup - so eggs forbreakfast in the cottages tomorrow. Quite a few of our guests are off to Bridport to catch the end of the Bridport Food Festival. My local Rotary club were present at the Beer Festival last evening where we cooked many burgers for the hungry revellers. Although our burger stand was positioned outside the Beer tent we benefited from the music and the atmosphere which was absolutely great. We are just about at the end of the season for feeding lambs although our little flock are still here on the farm. Recently Arthur and William came to stay with their parents and grandma, and helped Andrew with feeding. They also helped us to give the lambs names! Billie, Bobbie, Bernie and Belle. So now together with Anna, Elsa and Cheeky (or Greedy), they are being weaned onto grass, with fewer milk feeds a day. Also recently Zachary - who was staying in Hopscotch cottage, made us a lovely picture of a chicken and egg, after helping us to collect them with his brothers Reuben and Samuel. His picture is featured on the 'on the farm' page of the site. We have started to work in partnership with Jurassic Electric, who offer electric bike rides in the area. Today our first tour left Graston Farm to explore the Bride Valley. As an electric bike rider myself - I'm a great fan of this form of transport. The hills just melt away, leaving the rider to fully enjoy the scenery and the countryside. Its a great way to get back into cycling if it has been awhile since you rode a bike, and for local journeys it means no more parking problems, less fossil fuel use and a feeling of being in touch with the environment around us. So! if you are coming to Graston Farm Cottages this summer, enquire about these tours. We also have some regular cycles available for hire just ask! Cassie and I have been walking before lunch and had the most lovely time. The meadow flowers are so vibrant and plentiful, and there are loads of butterflies down by the riverside. The pheasants are everywhere and we detect a new brood by the silage pit on the farm. Also ducks are protecting ducklings on the lagoon. The 'Mables' are laying well, there are 10 hens and yesterday they rewarded us with 10 eggs. Children visiting the farm like to go and help Andrew collect them, and also get involved with feeding the lambs and calves. Last weekend we had visitors in all four cottages who had met at university some years ago. The layout of the cottages and their proximity to each other meant that the guests could gather for meals and leisure, but also find their own space for quiet times. In all we had 13 children staying, across the four cottages, although despite pretty poor weather they managed to find things to amuse themselves. They all enjoyed the Burton Bradstock Food Festival which is held annually on the Hive Beach, and also treated themselves to lovely meals at the Anchor and the Hive Beach Cafe. One of the wonderful things about this part of the world is that there is literally no light pollution. We are about a mile from the village of Burton Bradstock, a village with no street lights, so when the skies are clear at night views of the stars are quite amazing. Apart from lambs bleating and farmers going about their work, there is very little noise also, so its a perfect place to seeks some peace and quiet. Why not look us up and see for yourselves!